Garbo Lobster said it went from selling up to 150,000 pounds of lobster per week to China to "now that has dropped to nothing." 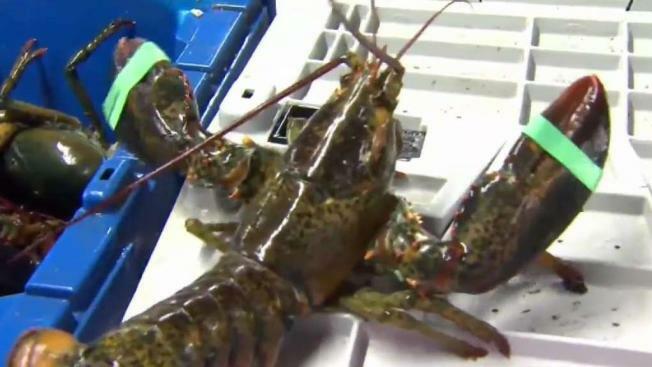 A Connecticut lobster company says they are being hurt by the tariffs imposed on live seafood being shipped to China. The effects of the Trump administration's escalating trade dispute with China is rippling through the U.S. economy and putting Connecticut's lobster industry in the crosshairs. Groton-based Garbo Lobster is one of North America’s leading exporters of lobsters. But, according to General Manager Chris Brown, the company has lost a significant portion of its business since China doubled tariffs on live U.S. seafood in retaliation for U.S. tariffs on billions of Chinese imports. "Last year, during the summer months, we'd be shipping these out on a daily basis, no problem," said Brown. "It has really caused us to look at our model and alter it, our volumes are much lower so we have to really reduce the amount of drivers, reduce the amount of production staff." In 2017, the U.S. exported more than $142 million worth of lobster to China, up from about $108 million in 2016, The Associated Press reported. This year, that number is expected to take a big hit as the industry's biggest international market appears to have lost its appetite for New England lobster. "We were shipping anywhere from 100- to 150,000 pounds [of lobster] a week on a given timeframe to China," Brown said. "However, now that has dropped down to nothing." President Trump announced in June it would slap 25 percent tariff on $34 billion of imports from China. Beijing responded by increasing taxes on the same amount of American imports. Rep. Joe Courtney (D-Conn.) noted that Trump's tariffs are increasing the price of lobster by $2.50 a pound, resulting in a situation "where the government is creating an added cost." Courtney said he is concerned that Trump’s trade policies are hurting other American companies. "Unfortunately, they’re not alone in terms of the tariff impact on dairy, on soybeans, pork producers, different parts of the country," he said. Companies in nearby states that ship shellfish overseas are also feeling the pinch, Courtney said. Meanwhile, Canadian companies are benefiting after China lowered tariffs on lobster imports from the U.S.'s neighbor to the north. "I would ask [President Trump] to consider more free trade opportunities and to be able to compete in the seafood industry in really markets across the board," Brown said.